For those of you exposed to the full force of SAP marketing for SAP IBP, I’m sure you will have heard the phrase ‘financialising the plan’. But have you ever stopped to think about why this is beneficial and what this means in practice when it comes to implementing it in SAP IBP? There was a time, some years ago I would have to admit, when Finance did their thing, Manufacturing something different and as for Sales, well…! However, to run an effective and competitive business these days, all of the functions have to work together in an integrated fashion and that means one common set of plan numbers. So what has this got to do with financials? Well at the end of the day, any commercial business exists to make money for its equity or debt holders after taking in the revenue from customers and paying all the expenses it occurs, from salaries to purchases and tax. Well less so for the last one for some businesses! The end result, earnings and all the incomes and costs that determine this figure are expressed as monetary or financial values. Financial figures therefore have to be the lingua franca of the business plan. So as you can see what started out relatively simply, is already becoming more complex. As an example of simplified financialisation, I show an IBP Excel sheet in Figure 2. Here you can see that the net price (i.e. net of discount) is multiplied by the Sales forecast quantity to yield a net revenue value. In the supply chain world we are quite used to seeing attributes such as plants, customers, vendors, regions, products and product families. However, these are not really characteristics that the money men in finance and the Board really care about. In a large, or even medium sized organisation, in order to effectively manage the business, the company has to be divided up into smaller chunks and the profitability controlled individually for each sub-unit. In management accounting terms, these sub-units are called Profit Centres. The division may be on market, sales channel, product division or a combination of all three. Most companies will also have subsidiary companies – sometimes one for each country in which they operate and each company code will have several Profit Centres. There is normally a hierarchy of profit centres for reporting purposes, building up finally to the whole organisation. So the message here is that you are going to have to include profit centre, company code and associated attributes in the master data structure. Once we have identified the need for a financialised plan, we now need to decide to what extent in the financial Income Statement, aka Profit & Loss, we go to. In Figure 3, I show the typical Income Statement structure at a high level. Note how the incomes are always positive and the expenses negative. This means that the calculations are always additions rather than having to remember if I should add or subtract an item. Engineers like me sometimes say this is because Accountants never learned about subtraction, but the truth is that it is entirely logical in systems terms: money into the enterprise is positive and out is negative – the balance is the sum of the two. You may think this is a trivial thing, but many from the Supply Chain world and where it is implemented in APO would store or calculate costs as positives and then subtract. This is even the case for the pre-configured solutions in IBP provided by SAP. We could, for example, only take the calculation to Net or even only Gross Revenue. For this we only, and I say ‘only’ with tongue in my cheek, need the volume and price forecasts and to go to Net Revenue discounts and rebates. So why did I intimate that even doing this is harder than it looks? Well just a very quick consideration yields some key issues to consider as shown in Figure 4. There are so many more aspects that need to be thought about for prices that I will save these for a future blog on the topic. If you are going to go down to contribution margin you will need to net off the Cost of Goods Sold (COGS). Most businesses will have some sort of cost per unit calculated, but will they have a cost per unit forecast valid for the full planning horizon of a couple of years? I know one customer who has a special system that is just used to generate COGS forecasts based on future material price indices etc. All the way to the bottom line? So what about taking the financialisation lower down the Income Statement? 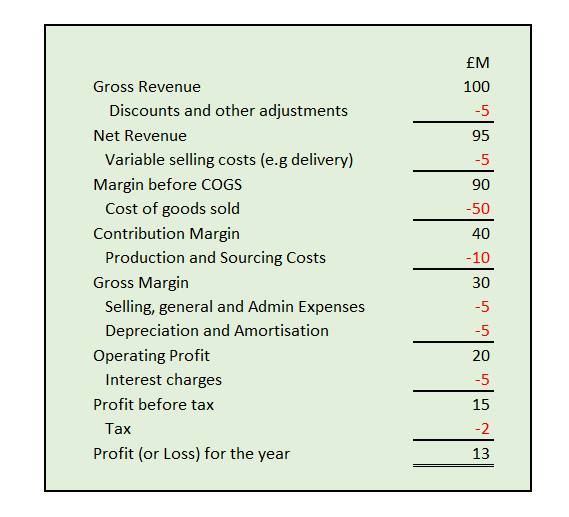 Well the first thing to realise is that once we go below Gross Margin, we are into the realms of indirect costs – i.e. costs that are in the main fixed and not attributable to particular products and/or customers. This means that we need to have planning levels that drop the associated product and customer related master data and focus just on profit centres and maybe different sales channels. Financial year vs rolling plans? Users of planning views in tools such as APO are used to rolling periods: i.e. the first period shown is normally the current day/week or month. You are always looking ahead and the past is only useful for statistical forecasting. When you are looking at financials, you are more concerned with the current financial year and that means you use a fixed horizon rather than a rolling one. As I show in Figure 5, it is also common to show the Year to Date (YTD) and Year to Go (YTG) totals as well as the total for the year. The key figure displayed is itself also a composite of two key figures. For past months it is displaying the actual sales and for the current and future periods the forecast. There is an important point I need to make about using unit costs in scenario planning. This is fine if your scenarios only involve changing the product mix volumes. However if you are making changes that affect the unit cost itself – adding weekend shifts where the labour rate is higher for example or sourcing materials from a higher cost external source to meet extra requirements – you will need to model costs from the bottom up rather than use a cost per unit. In the above example there will need to be a cost for each resource associated with either the capacity or capacity consumption; depending on whether you are treating it as a fixed or variable cost. Plus we have just indicated that the cost of capacity is not constant as adding extra may be more expensive per hour or unit. Then the model also needs to handle all the other cost elements such as raw and pack materials and roll them up to a total cost. What’s involved in implementing it? For those readers who have worked with APO DP, you may have included some financial values such as Revenue in your planning books but it wasn’t straightforward to go any further. The good news is that with SAP IBP, it is entirely possible to go all the way to the bottom line and customers are doing it today. However, IBP needs to be configured to do it and the sample planning areas provided by SAP only go so far and may need to be modified significantly to meet your requirements. In a subsequent blog I will go into some of the practicalities of configuring IBP to achieve financialisation. SAP IBP is an excellent tool for financialising plans. It can bring together the two worlds of supply planning and finance in a way that other SAP products such as APO and BPC cannot. However, doing so is complex and you have to have a clear idea from the outset of how far you want to go and your objectives in doing so. Wonderful blog Steve. Thanks for the same.